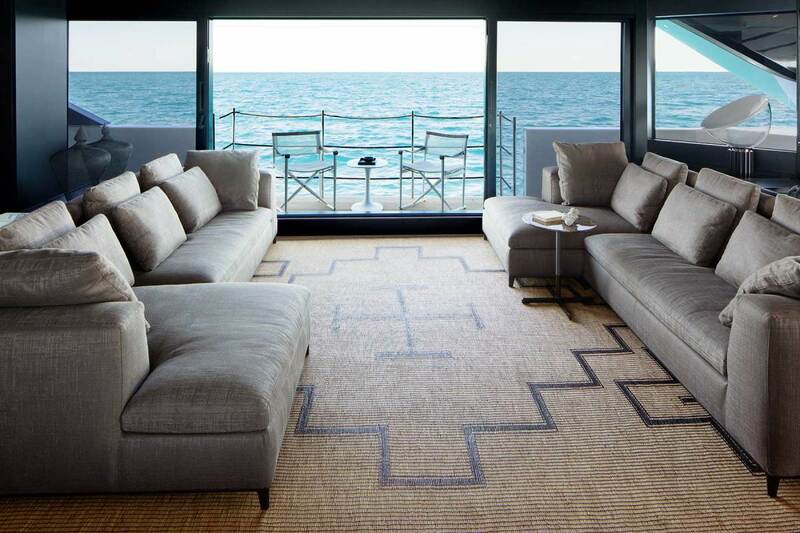 Sanlorenzo’s SL102 bucks design tradition, showing that asymmetry also can mean harmony. Boats have been designed along symmetrical lines ever since Noah’s Ark. Below the waterline, this obviously makes hydrodynamic sense (unless you’re building a gondola, which has a wobbly hull form so it will steer straight when rowed from one side). Superstructures are another matter. On all but the fastest boats, there is no pressing reason why a superstructure should be aerodynamically symmetrical. The fact that they almost invariably are, aside from weight and stability considerations, is more a consequence of tradition than necessity. 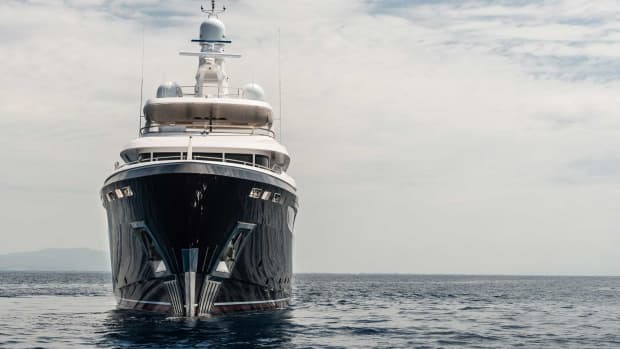 Both the exterior and interior design by Zuccon International Project draw on the sophisticated Italian aesthetic that is Sanlorenzo’s calling card. 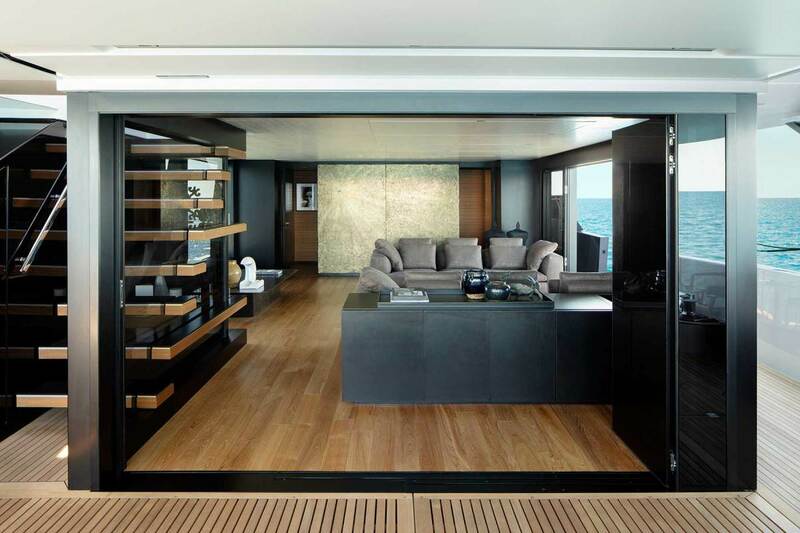 Note the glass-walled staircase connecting the main deck and the fly deck. 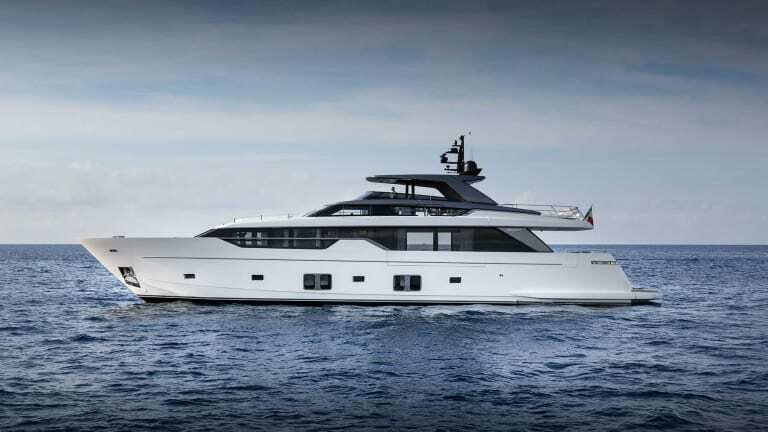 Sanlorenzo bucked the trend by adopting an asymmetrical layout as the starting point for the SL102. Chris Bangle, the former head of design at BMW, initiated the concept. Variously viewed as a forward thinker or maverick agitator, he likes to view objects from upside down to reveal their design flaws. 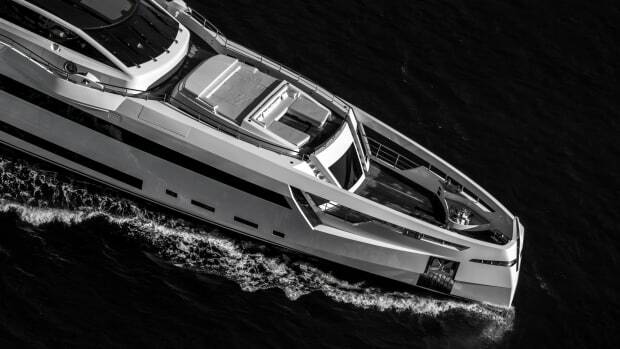 With Sanlorenzo, he questioned some fundamental tenets of modern yacht design. 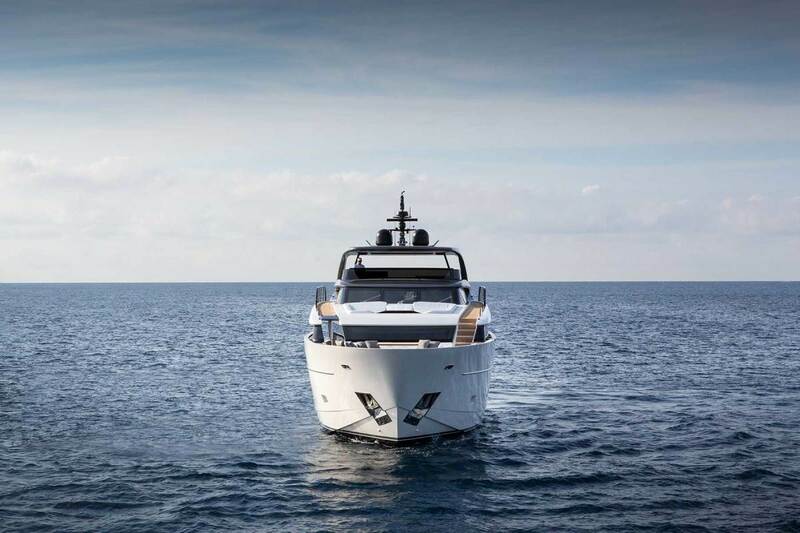 Sanlorenzo bucked the trend by adopting an asymmetrical layout as the starting point for the SL102. Chris Bangle, the former head of design at BMW, initiated the concept. 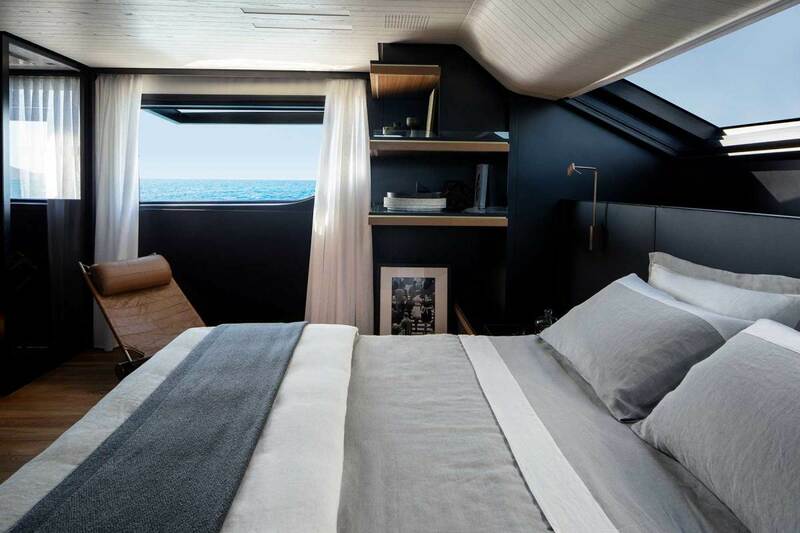 Taking this observation as a starting point, brother-and-sister design team Bernardo and Martina Zuccon of Zuccon International Project developed a yacht that used asymmetry to increase onboard living space for guests and improve operational efficiency for crew. 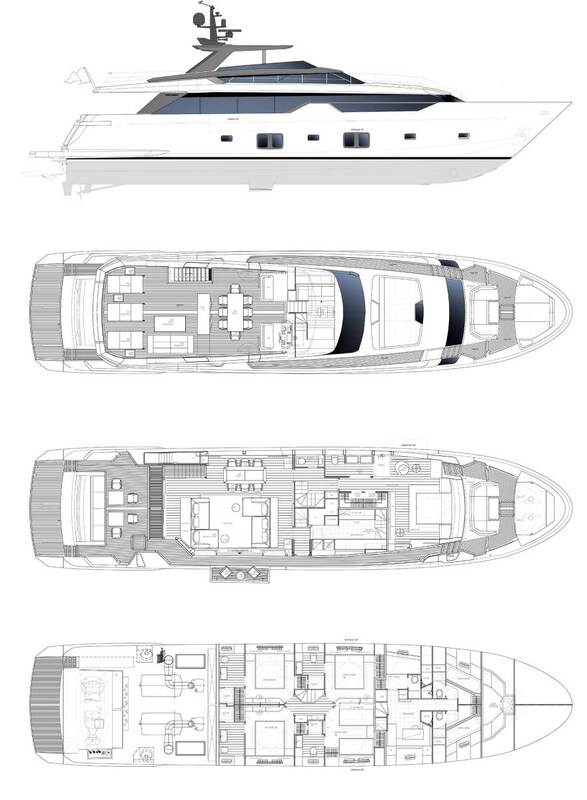 Having a wide-body main deck configuration can provide more living space, but on yachts smaller than 120 feet length overall with a raised pilothouse, there is insufficient space for dedicated service pathways. A deckhand moving between the bow and stern has to pass through the guest areas, which is less than ideal. 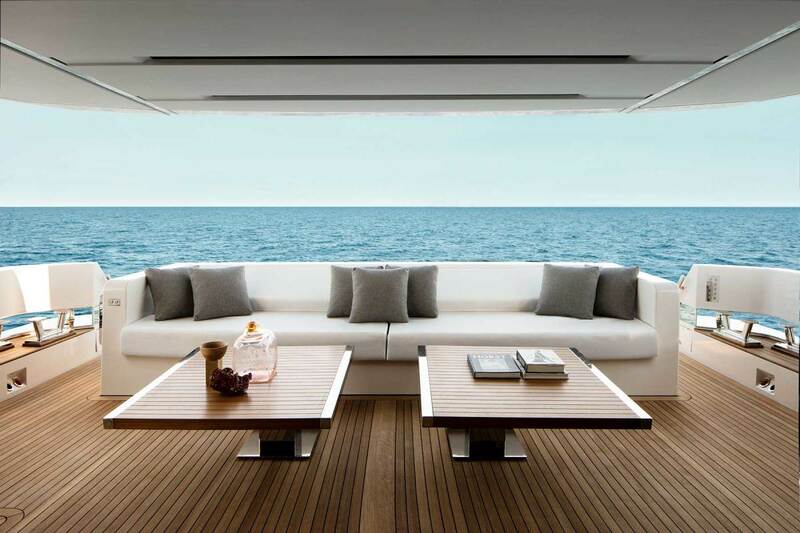 The alternative—adding side decks—reduces the interior living space. The asymmetry becomes evident when viewed from dead ahead. 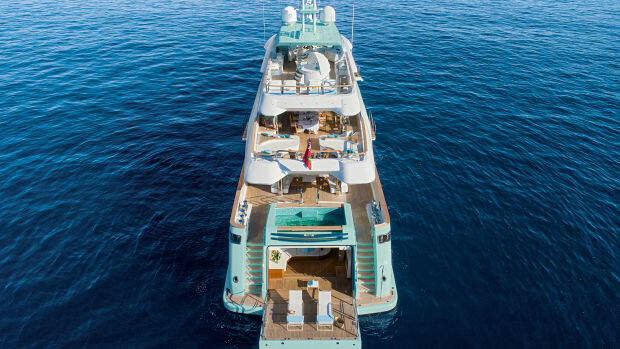 The starboard walkway on the main deck is balanced by the portside steps from the fly deck to the mooring station in the bow. 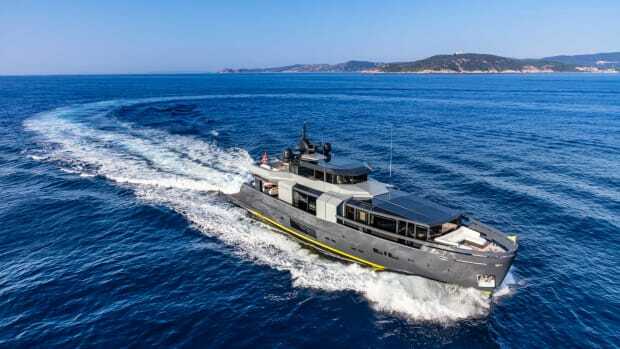 The solution on the SL102 is to have a side deck running the length of the main deck to starboard, with the lounge and dining area, and the master stateroom, abutting the portside bulwark. 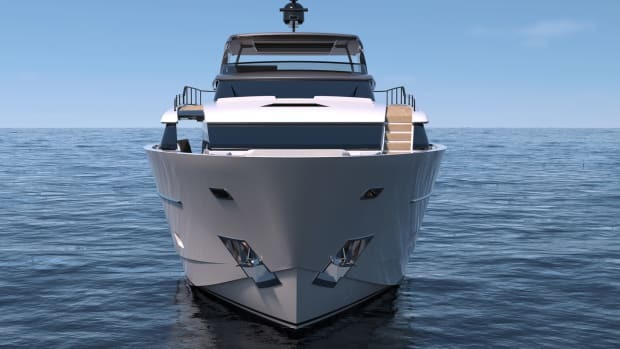 Sanlorenzo says the lack of a side deck to port allows for an extra 107 square feet of interior living space. Moreover, a section of the starboard bulwark slides down for better visibility from the salon while underway, and folds out to provide a balcony at anchor. The fold-down terrace in the main salon adds an al fresco touch. 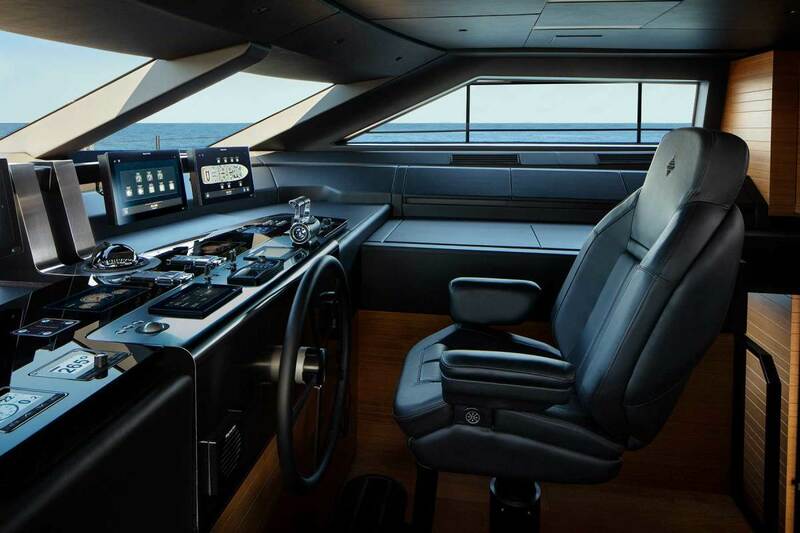 On the flybridge, the asymmetry is reversed, with a port side deck flanking the raised pilothouse and a series of steps leading down from the side deck to the seating area and mooring station on the foredeck. The concept goes against one of the most coveted principles of design—symmetry—but the unconventional layout of the SL102 has been flawlessly integrated into the overall design. Much like trompe l’oeil techniques in painting are used to alter the viewer’s perspective, unless you look at the yacht from directly ahead or astern, the asymmetry is virtually invisible. 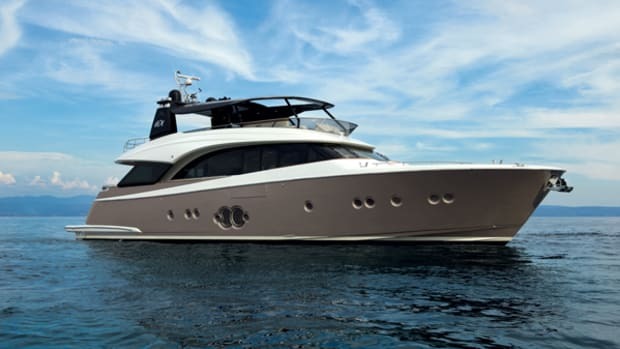 The leather-clad raised pilothouse offers a sheltered option to the open flybridge. The standard arrangement has a master stateroom on the main deck forward and four guest staterooms below. For the U.S. market, there is the option of replacing the main-deck master with a country kitchen-style galley and relocating the owner’s stateroom to the lower deck amidships. Both arrangements offer a crew mess and quarters for four on the lower deck forward. The interior décor is also by Zuccon International Project. 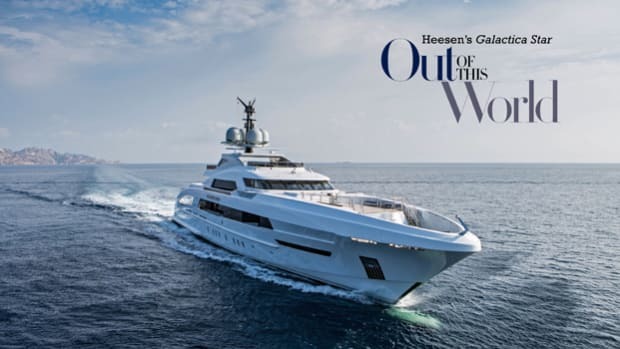 It draws on the sophisticated Italian aesthetic that is Sanlorenzo’s calling card, and can be customized for clients. 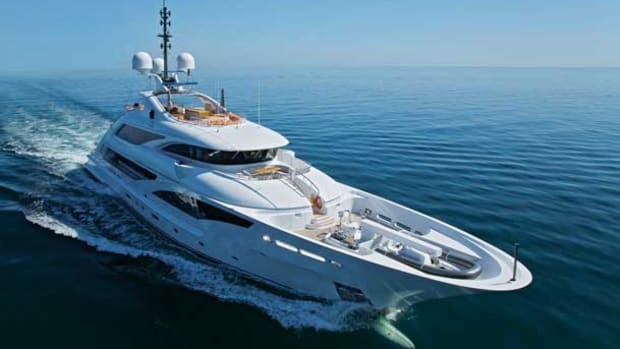 Twin 16V MTU M86 or M96 engines are available, for a top speed as fast as 29 knots and a cruising speed around 25 knots. 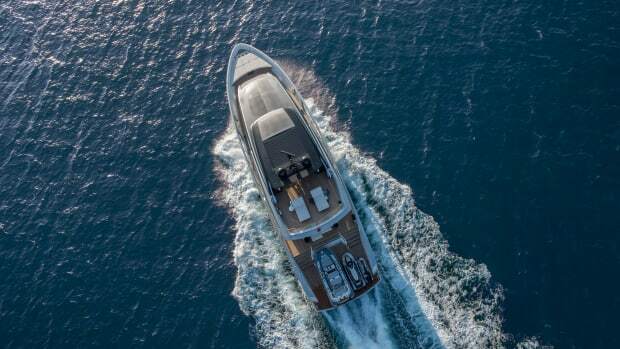 With 11 units of the SL102 sold since its presentation in spring 2018, it would seem that Sanlorenzo’s gamble has paid off. There is also some talk of extending the asymmetrical concept to other models in the SL range. Now, such talk just seems natural.